18th generation of Chen style Taijiquan, Grand master Feng Zhiqiang is the president of “Beijing Chen Style Taijiquan Research Institute” and the president of “Zhiqiang Martial Arts Academy”; he is an advisor for many martial arts associations in China. Born 1928 in Shu Lu County, Hebei province, he has over 66 years of martial arts experience. At a young age moved to Beijing and became a disciple of the legendary Grand master Hu Yaozhen. There after became a disciple of the, 17th Generation Chen family generation, grand master Chen Fake. In 1986 grand master Feng Zhiqiang created “Chen style Xinyi Hunyuan Taijiquan”, and since than wrote numerous works and teaching materials about it. Grand master Feng is one of the biggest promoters of Chen style Taijiquan in this century, and is well revered all across China and in the whole world. At the age of 12 Feng was sent to relatives in Beiping (today’s Beijing) to learn repairing electric appliances. One of his neighbors there was a Tongbei expert (also skillful in point striking and “Light Skill” – Qinggong) from famous Cangzhou County in Hebei Province, Han Xiaofeng. Feng studied under Han’s guidance for four years, not only learning Tongbeiquan, but also Red Sand Palm skill (hands hardening method), kicking wooden posts and striking sand bags. Feng was able to break five bricks with one hand strike. At the end of 40s there were two martial artists very famous in Beijing – Xinyiquan (Xingyiquan) master Hu Yaozhen from Shanxi Province, called “One Finger Shakes Heaven and Earth” (Dan Zhi Zhen Qiankun), expert not only in martial arts, but also traditional Chinese medicine and Taoist meditation methods; the second was Chen Fake, 17th generation inheritor of Chen style Taijiquan. At the age of 20 Feng Zhiqiang through introduction of one of his Kung Fu brothers (who was from the same town as Hu Yaozhen) met Hu Yaozhen. Hu criticized Feng’s practice methods saying they were “ruining his body”. To make Feng understand better what he was talking about, Hu asked Feng to hit him. In spite of using whole strength Feng was easily defeated by Hu who only used one finger against him. As the result Feng knelt in front of Hu Yaozhen and started his Neijia boxing studies. 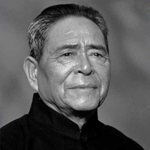 Feng studied Liuhe Xinyi Quan under Hu’s guidance for two years first learning Qi gathering methods, nourishing Qi, practicing Intention and Qi, Santi standing, Dantian Methods, Wuxingquan (Five Elements Fists), Twelve Shapes, 24 Hands . 18th Generation Grandmaster Feng Zhiqiang taught 19th Generatiion Master Shien Pu (Stephen) Tang and certified him in Chen& Hunyuan Taiji. Master Shien Pu Tang certified 20th Generation Shifu Marquez.